I didn’t anticipate Kuk Sool Won (KSW) becoming a part of my life, and for that matter, I wasn’t even seeking a martial art. I was happy practicing yoga and running every now and then. I was introduced to KSW by my partner, who is dedicated to it. I went because I was curious. I went because I wanted to support him. I went because I like moving. I didn’t go because I thought I was going to be caught by the gifts that KSW can bring into your life, but I can tell you that it has done nothing but add to mine. KSW has brought me an awareness of balance, in the body and mind, in a way that yoga didn’t. I have grown stronger physically and mentally because KSW is grounded in Eastern philosophy that is embodied through a thoughtful curriculum and taught by one of the best instructors I have had the pleasure of teaching me. PSBN Gehrik walks the walk right alongside you and upholds the standards of this martial arts system. The lessons KSW has taught me has also started to bleed into my professional life. I am a social worker, and in any helping profession self-care must be a priority. KSW started as a small exploration, one that I didn’t see (or want to) become a part of assisting me to live in this world. If you are considering a martial art, come try on KSW. You may find, as I did, that is a perfect fit. My son was interested in martial arts at a young age. 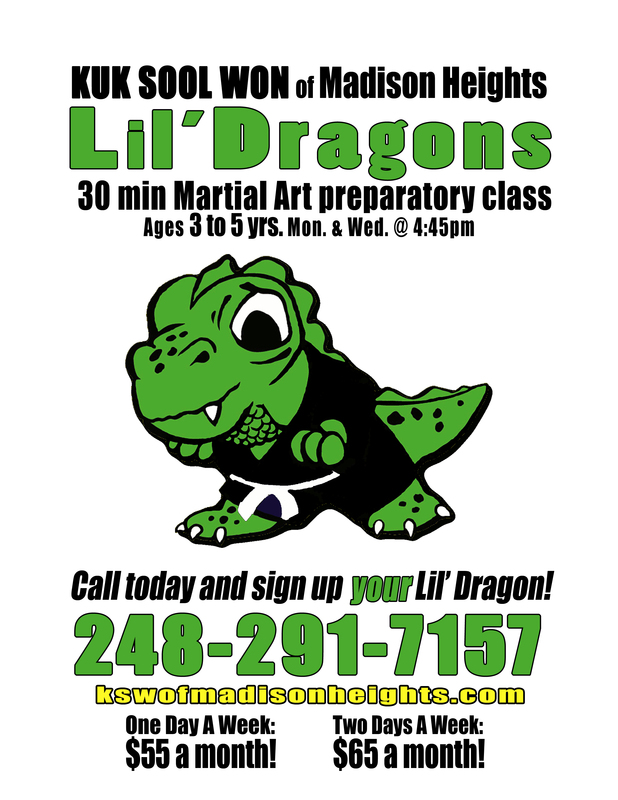 When he turned 4, we both went to Kuk Sool Won (then, of Royal Oak) of Madison Heights to try a class and were instantly hooked. It is now eight years later and we both have earned the rank of First Degree Black Belt. Both of us continue to train and assist with classes at the dojahng several hours each week. The fact that we have an activity that we can do together continues to be one of my most satisfying experiences as a mother. The result is that I’ve had the pleasure of watching my son grow and mature into a respectful, self-motivated, high-achieving young man. He fearlessly accepts physical and academic challenges with confidence and diligence. As for me, I have the strength and flexibility of some people half my age, and have learned to face all challenges with a positive and healthy attitude. I am a Teacher’s Assistant working with Autistic students and I love to study Martial Arts when I’m not working in school. I find Gehrik Mohr to be one of the best instructors I’ve had in a while. He understands what is important in Martial Arts and is able to adapt to the students level to work from where they are at. He pays attention to details making sure students learn the fundamentals first before working toward harder stuff as to avoid injury and ensure the students are learning properly. There is also a large focus on self discipline and etiquette which is both very powerful for people to learn, particularly children, but also something I have seen skipped in other systems. The classes can also be fun at times, with us training in the park or being given interesting challenges for the day. I have been to several schools and styles of Martial Arts and I have found no better place to train in the area than at Kuk Sool Won Madison Heights under Gehrik Mohr. I would suggest his classes to anyone interested in Martial Arts or Fitness in general. I also highly suggest this for any parents who want their child to learn self control, etiquette, and a plethora of other skills useful in school and at home. I have been training as a student of PSBN Gehrik Mohr for 15 years, and 5 more years before that from his teacher, (a hard act to follow). As a professional in the field of health, I can highly recommend Mr. Mohr for his professional and sincere effort to help people of all ages, as he helps you to achieve your personal health goals, your self defense goals, your physical fitness goals, self respect, respect for others, patience, not to mention the science, art, and philosophy of Kuk Sool Won, the greatest martial arts system available today. PBSN Gehrik is an outstanding teacher for my 7 year old son. Teaching respect by giving it to his students. He leads by example and still knows how to have fun. 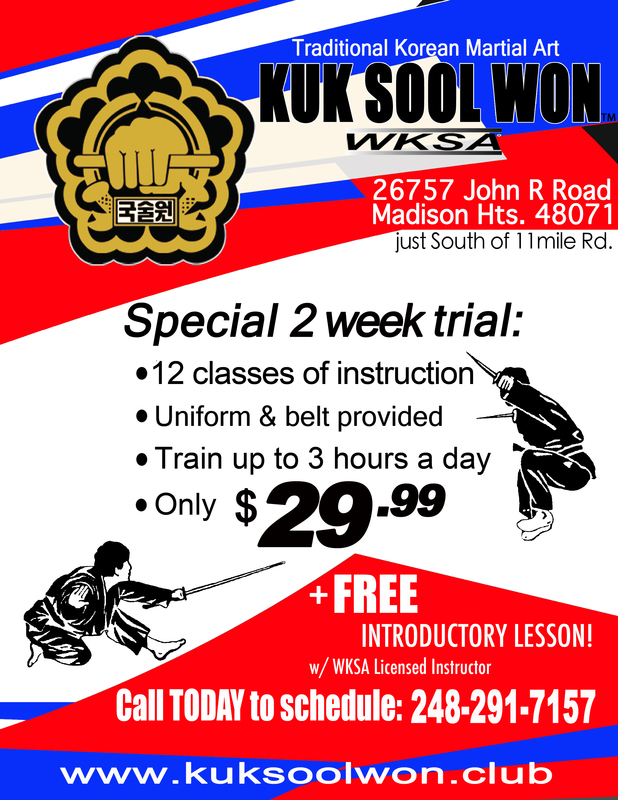 I’m thankful to have found Kuk Sool Won of Madison Heights.